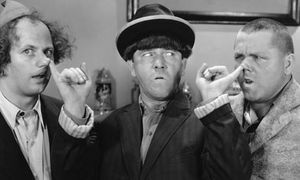 The Three Stooges are one of the most iconic television shows to ever air. They have been made in books, films, video games and many other forms of media over the years because the type of humour that they displayed was appropriate for people of all ages. Realtime Gaming has produced a mobile game based on this show and its characters, and it has recently been released at some of the most popular sites that run their software. This includes both WinPalace Casino and Casino Titan, two of the leaders in the industry when it comes to sites that use this particular software package. The Three Stooges mobile slot had its debut earlier this morning, and it's a great title. It's based on a three-reel format, but it includes a number of special features that you wouldn't normally find on a game with so few reels. For example, there's a progressive jackpot that hits randomly and that doesn't require any specific winning combination, so that's an extra chance to win on every single spin. On top of that, you can win a massive number of free spins during the bonus feature which awards up to 100 free turns on the game. New mobile games like this are really important, even if they are ports of games found in the downloadable version of the online casino. The reason for this is that mobile is frequently seen as the major direction that the industry is heading in as a whole. To prepare for the future, Realtime Gaming has been adding titles to their mobile platform, and the Three Stooges is just the latest to be added for those reasons. With a better selection of games available on their mobile software, more and more players are encouraged to play. If you're looking to play this title, then WinPalace Casino and Casino Titan are both good choices. Each of these sites uses the Realtime Gaming software, and they both offer multiple ways to play the Three Stooges slot. On top of that, you can cash in on great reload offers that are available each week from both of these online casinos. They both frequently offer reloads worth up to 400 percent on a weekly basis on top of free spins, cashback and other promotional offers.